Ankara expects that Russia will take steps to close the office of the Syrian Kurdish Democratic Union Party in Moscow, as it has informed Moscow that it sees no difference between the PYD and the Kurdistan Worker's Party, a designated terrorist group in Turkey, Foreign Minister Mevlut Cavusoglu said Thursday. ANKARA (Sputnik) — The PYD is the leading left-wing Kurdish party of Rojava, northern Syria's de facto autonomous Federation of Northern Syria, which declared autonomy in March 2016 amid the six-year conflict in Syria. The party is striving for participation in the Geneva and Astana talks on Syrian settlement, but Turkey has insisted that the PYD should not take part in the negotiations. "We are talking to our Russian partners at all levels that the terrorists from the PKK and the PYD are the same. That is why we expect that Russia will take a step to close the PYD office in Moscow," Cavusoglu told reporters in Ankara. Turkey believes the PYD has links to the PKK active in southeastern Turkey, and that the group regularly comes into confrontation with the PYD and its military wing People's Protection Units (YPG) operating in Syria. Meanwhile, Russia and the United States support the Syrian Kurds, as both countries consider the group's self-defense forces to be an effective force in fights against Daesh (banned in numerous countries) terrorist group. Turkey wants to strengthen relations with Russia in all spheres, including trade, and hopes that the relevant ministries will hold talks and take necessary measures, Turkish Foreign Minister added. "We want to enhance our relations with Russia in all directions, including in trade. Of course, the restrictions imposed by Russia against Turkish goods complicate the development of the relations. During visits of our leadership to Russia, we raised the issue of removing the restrictions. There is no place for blackmail in international relations. We hope that representatives of the relevant ministries will hold talks and take measures step by step," Cavusoglu told reporters. According to the minister, Turkey is eager to welcome back Russian tourists. 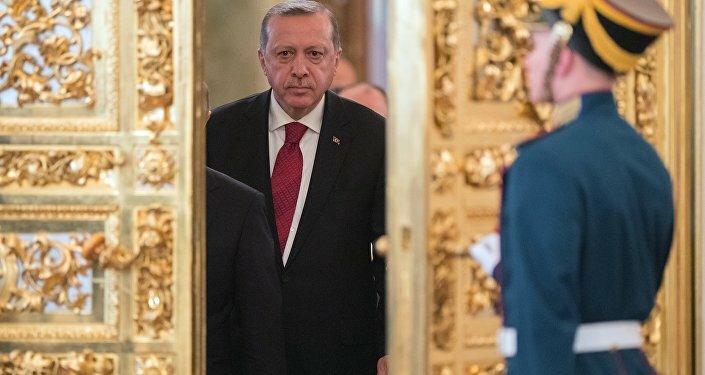 Russia's food embargo on Turkish goods was introduced on January 1, 2016, when Moscow imposed a ban on the import of food and plant products on Ankara in response to the November 2015 downing of a Russian aircraft by Turkey over Syria. In October 2016, the Russian embargo on Turkish fresh and dried fruits was lifted, but the importation of tomatoes, apples, strawberries, zucchinis, pumpkins and most poultry products are still banned. The embargo remains partly in place but it has been eased, as the Russian government has exempted fresh and refrigerated onion and shallot, fresh and refrigerated broccoli and cauliflower, along with several other products.